“Health trumps politics,” said Iowa State Senator David Johnson before taking the stage at a raucous rally in Des Moines last winter to support strengthening the state’s water quality. In the marble rotunda of the state capitol, he rose to denounce the nitrogen and phosphates that have been flowing in ever-increasing quantities into Iowa’s public water supplies — and was cheered by the small crowd of family farmers, concerned mothers, and his new political allies, the legislature’s drastically outnumbered Democrats. Johnson had been one of the longest-serving Republicans in Iowa until he left the party to become an independent in 2016 after defying it repeatedly on one of the most divisive issues in Iowa — the integrity of the state’s water. Iowa’s nitrogen load has been accelerating despite more than $100 million spent by the federal and state governments to rein it in. Starting in 1999, the concentration of nitrogen in the state’s major waterways has increased almost 50 percent, according to a study from the University of Iowa, published last spring in PLOS One. The battle over Iowa’s water had long been posed as one between rural and urban interests, until Johnson, whose district is one of the most thinly populated and heavily farmed in the state, came along. Ninety-two percent of the nitrogen and 80 percent of phosphates in Iowa’s waters come from farms and animal feedlots. Johnson describes himself as a moderate and a strong opponent of abortion. He is tall, loose-limbed, and acerbic. His concern over the health impacts of the state’s increasingly polluted water supplies has turned him into an unlikely leader of the fight now underway over the accelerating stresses on water in Iowa, where large industrial farms abut key waterways. More than 750, or 58 percent, of the state’s rivers and streams do not meet federal water quality standards and are designated by the Iowa Department of Natural Resources (DNR) as too contaminated for swimming or consuming fish caught there — making a state once renowned for its lattice of waterways into a mess of inaccessible creeks, streams and lakes. Another 23 percent fall into a category of being “potentially impaired,” which the state defines as, “waters in need of further investigation.” Ninety-two percent of the nitrogen and 80 percent of phosphates in the state’s waterways, says the DNR, come from farms and animal feedlots. All the water running through Johnson’s district — in the Floyd, Little Sioux, and Maple rivers — ultimately flows west into the Missouri River, which winds its way south to the Mississippi River, which then dumps the toxic legacy of Iowa farms into the Gulf of Mexico. It’s the same for rivers like the Des Moines and the Raccoon, which wind their way through Iowa and end at the Mississippi. For the last decade, Iowa has been the first or second biggest contributor to the toxic dead zone in the Gulf, an area about the size of New Jersey where few living creatures can survive because the pollution has deprived the water of sufficient oxygen. But long before the waters of northern and western Iowa reach the Mississippi, they pass through the more densely populated towns and cities of Iowa and leave their legacy in the water that millions of Iowans rely on to drink. 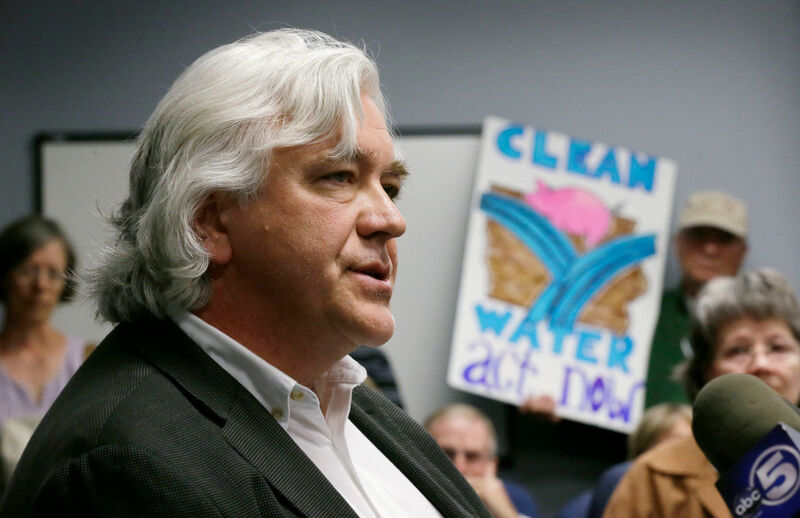 On that January day, Johnson was joined in the capital by an unlikely ally, Bill Stowe, CEO and general manager of the Des Moines Water Works (DMWW), a public utility responsible for the safety of the city’s drinking water. What Johnson sees flowing off the fields across Iowa, Stowe sees in the water he’s supposed to ensure is safe for the more than 500,000 residents of the greater Des Moines area, situated at the confluence of the Raccoon and Des Moines Rivers. “Iowa has become the sacrifice state for industrial agriculture,” says Bill Stowe, a Des Moines water official. The two could not be less similar in appearance and demeanor. Urbane and charismatic, with a long mane of gray hair, Stowe looks more like the keyboard player in a classic rock band than the state capital’s chief water engineer. Stowe famously filed suit against two upriver counties in 2015 demanding compensation for the costs of filtering Des Moines water to meet minimum drinking water quality standards. The price tag for installing the city’s filtration facility in 1991 was $4.1 million, and it costs $7,000 a day to operate. The utility has raised its water rates between 4 and 10 percent every year over the past decade to keep pace with the rising filtration costs, and in 2017 it announced that it would have to either double the capacity of its nitrogen-filtering tanks at a cost of $15 million or develop alternative groundwater sources. The water utility has had to spend as much as 9 percent of its operating budget on nitrate treatments. Stowe has survived Republican efforts to defund his agency, and has joined forces with Johnson in a so far unsuccessful effort to pass legislation that would limit the agricultural and livestock industry’s ability to contaminate rivers used for drinking water. 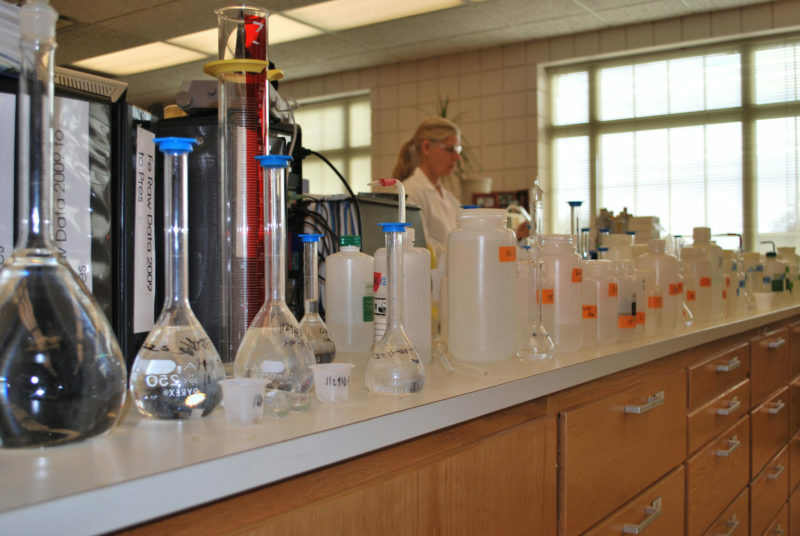 A sequence of studies of women in Iowa over the age of 55 found that sustained exposure to nitrogen levels of just 5 milligrams per liters — half the federally determined “safe rate” — may contribute to increased risks of bladder, ovarian, and thyroid cancer. According to Peter Weyer, former director of CHEEC and one of the nation’s foremost experts on nitrates in drinking water, more than half of the 42,000 Iowa women monitored by the center over a 30-year period had relied on the same water source for more than 20 years, giving extra credence to the researchers’ conclusion that it was nitrogen in the water, and not other potential sources, that was the main contributor to the elevated cancer rates. Another study on birth defects that centered on 10 locales around the country, including Iowa, found evidence suggesting newborn children face increased risk of conditions such as spina bifida and cleft palate if their mothers have sustained exposure to drinking water with half the federal limit for nitrogen. WATCH: The battle over clean water in Iowa. Every morning when Stowe goes to work, he confronts the challenge posed by Iowa’s upstream agriculture: which river to choose for his city’s water supply. He only has two options: either the Raccoon, which flows past a string of factory farms from the west, or the Des Moines, flowing to the city past farms to the northwest. Each morning, an intake valve delivers a water sample from each, which is run through the water works’ laboratory to test for contaminants. One day, the Raccoon might exceed the EPA standard of 10 parts per million of nitrogen. Try the Des Moines? On that same day the Des Moines might not be an easy substitute because rates of phosphorous are up, which raises the prospect of toxic algae proliferating and producing poisonous mycotoxins. There’s no way to filter algae; the filters get clogged. And if you have too much algae in the water you might have to shut down the public water supply altogether — which is what happened in the city of Toledo, Ohio over three successive days in 2014. The incident in Toledo haunts Midwestern water officials. If the Des Moines is showing too much phosphate, as often occurs, Stowe will choose the Raccoon despite the elevated nitrogen levels, a decision that means firing up the city’s nitrogen filtration system that day and adding another $7,000 to the ratepayers cumulative bill. Stowe’s lawsuit, originally filed in 2015, was intended to hold upstream agricultural counties liable for the mounting clean-up costs, but a state judge dismissed the suit on jurisdictional grounds. The judge ruled that a city water district has no legal standing to sue a county, and threw the matter to the state legislature. The legislature, according to Stowe, has done little to address the problem. Instead, Republican lawmakers have tried — thus far unsuccessfully — to defund the Des Moines Water Works and replace it with a body directly accountable to them. Senator Johnson further enraged his former GOP allies earlier this year when he fiercely opposed their low-budget approach to water monitoring: “We have done nothing but spit in the river that looks like chocolate milk,” he told Iowa Public Radio in denouncing the Republican water plan. Starting in 2008, state funding has been cut for water monitoring, as well as for conservation incentives designed to discourage overuse of fertilizers. Initiatives to promote the planting of cover crops to absorb excess nitrogen and the building of buffers between nitrogen-saturated fields and streams also lost funding. The Aldo Leopold Center, which is at the cutting edge of researching more regenerative agricultural practices — including strategies for reducing nitrogen-based fertilizer runoff — had its funding withdrawn in 2017, and its future has been in limbo ever since. The budget for state environmental health positions was cut in half from 2009 to 2017, from $22 million to $11 million last year. “I am pro-life,” Johnson said. “But what’s also very important to me is what happens between my concept of life at conception and what’s at the end of that. We need to fill that space with good things — excellence in education, a clean environment. That’s number one.” In 2016, he left the party shortly after the nomination of Donald Trump for president — which tipped the scales for Johnson. He became the lone independent in the Iowa legislature. In June, he dropped out of his race for reelection after facing major obstacles in raising money to run in the solidly Republican conservative district. 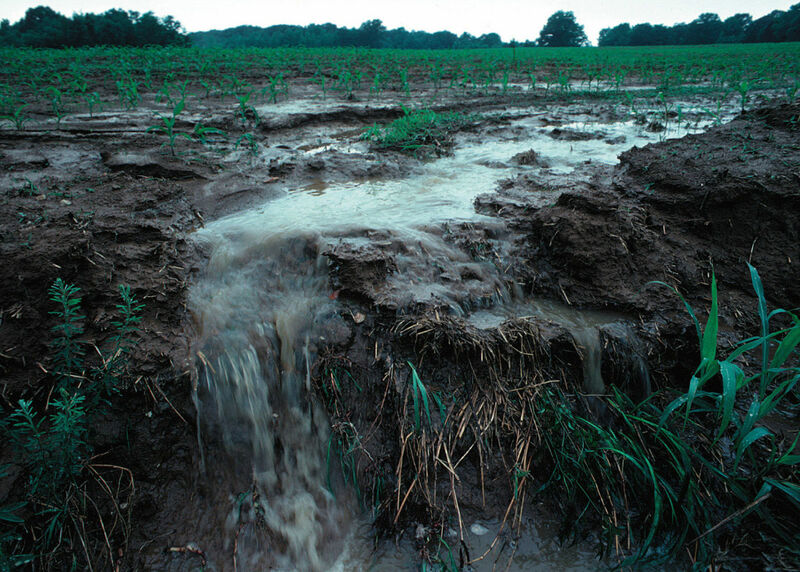 In 2016, in the waning days of the Obama administration, the EPA identified phosphate and nitrogen farm runoff in U.S. water supplies as a serious threat to the public’s health, identifying the two contaminants as “the single greatest challenge to our nation’s water quality.” The agency called for identifying those responsible and began devising strategies to be pursued by the federal government to slow down the rates of contamination. Instead, the Trump administration cut the EPA’s water monitoring budget by almost a third and eviscerated water quality enforcement. Meanwhile, millions of residents in Iowa and along the Mississippi River corridor remain, as in the case of Des Moines, on the hook for millions of dollars in filtration costs, and exposed to the harmful impacts on their health. Water quality is turning out to be a major issue in the upcoming midterm election in Iowa — most notably in the state’s race for governor between the incumbent, Republican Kim Reynolds, and Democrat Fred Hubbell, who has made water quality a key part of his campaign platform. In August, Johnson endorsed the Democrat, a first in his long career in state politics. Travel for reporting this article was made possible by an award from The Fledgling Fund and Invoking the Pause. Correction, October 1, 2018: An earlier version of this article incorrectly stated that the Des Moines River starts in Iowa. The headwaters of the Des Moines River are in Minnesota.